Avoid an answer? Throw dead cat on the table! If the transcript of a parliamentary select committee hearing were an obvious candidate for a musical then Andrew Lloyd Webber would probably have got there first. But Lord Lloyd-Webber has left the stage clear for the creative brains behind Committee or The Public Administration and Constitutional Affairs Committee Takes Oral Evidence on Whitehall's Relationship With Kids Company - to give the musical its full title. 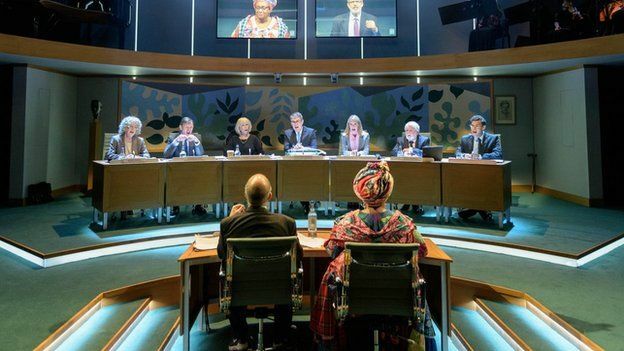 It is based on the verbatim transcript of the grilling of Kids Company founder Camila Batmanghelidjh and chair of trustees Alan Yentob (who is a BBC presenter and former BBC creative director). Committee members who appear as characters in the show include Conservative former Welsh Secretaries Cheryl Gillan and David Jones and veteran Welsh Labour MP Paul Flynn. 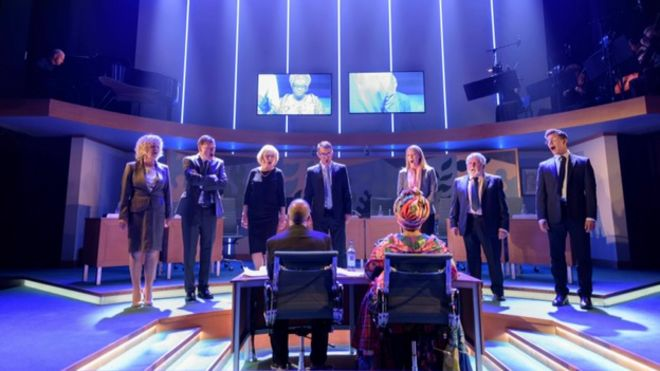 London's Donmar Warehouse stresses "this production has not been authorised by any participant or Parliament" but as a veteran observer of these things I'd suggest there is little for Parliament to get too upset about. It displays a fair insight into the way select committees work. Early on, a clerk reveals to the audience: "All select committees are hoping their report gets their chair an appearance on the Today programme - that's the golden thing, the 8:10am slot on the Today programme". Cue a tuneful chorus of "the 8:10 am slot" from the cast. Image captionMPs on the Public Administration and Constitutional Affairs Committee grill Alan Yentob and Camila Batmanghelidjh in a scene from 'Committee'. Director Adam Penford said (during rehearsals): "The idea of doing a new verbatim musical based on the transcript of a select committee hearing is quite a crazy idea but potentially incredibly exciting. "Whilst it's part of the musical function to explore how we hold ourselves to account as a society it also asks multiple questions about the relationship of government to the people." The production presented new challenges for the actors. Robert Hands, who plays David Jones, said: "I've never played a real person before and I didn't know I could do it, I was a bit worried about it actually." He needn't have worried. Indeed, every member of the cast is thoroughly convincing and instantly recognisable to anyone who watched the original hearing or knows the MPs involved. Cheryl Gillan went to see it with other committee members. Her verdict? "A very interesting treatment of a very serious matter using the words that are in the public domain but surreal to see yourself portrayed on stage." Paul Flynn is played by Anthony O'Donnell ('Dai Davies' in Stella), who delivers Flynn questions - "a spiel of psychobabble, a torrent of words, verbal ectoplasm" directed at Batmanghelidjh - with the gusto of the original. The Newport West MP tells me he's looking forward to seeing it and meeting O'Donnell. He remembers Camila Batmanghelidjh's evidence with frustration. "It was all about distraction and changing the subject, throwing a dead cat on the table." A frosty exchange between the two of them about spending £150 of the charity's money on a pair of shoes for a client is given a suitable theatrical treatment. David Jones recalls: "It was the strangest parliamentary event I have been involved in. It was bizarre, the whole thing. Camila's conduct was extraordinary and in the end I gave up on her and just asked Alan Yentob questions. "I think it was valuable and I think the value of it was that action is being taken as a consequence of it." It was revealed on Monday that the Insolvency Service is trying to get the charity's directors, including Camila Batmanghelidjh and Alan Yentob, barred from holding company directorships for up to six years. Paul Flynn also believes there is "unfinished business" in the committee's investigations. You can sample the musical here or see it for yourself at the Donmar Warehouse, where it runs until August 12.